Last month I made this beautiful crocheted tote bag. Get the link to the free pattern below! 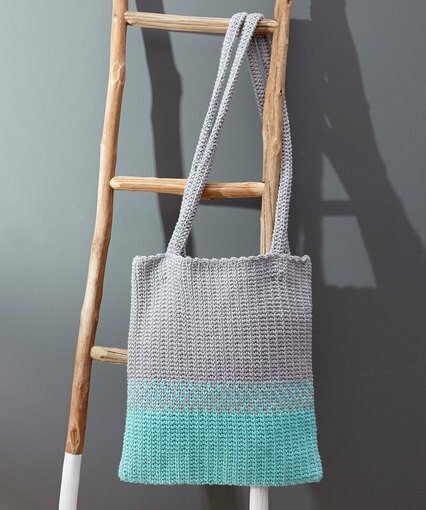 My July Crochetyay project pick was the Easy Split Tote Pattern available for free from Red Heart Yarns. It was designed by Bendy Carter and uses the split single crochet stitch. The pattern is available as a downloadable PDF and it includes a diagram to explain how to crochet the special split single crochet stitch and Marly Bird created a video tutorial too! I used the following supplies to create my tote bag. Yarn: 3 Balls of Red Heart Scrubby Smoothie Yarn. This is a medium weight  cotton yarn. 153 yd (140 m) per 3.5 oz (100 g). My project used a total of 282 g of the yarn. I used Blueberry ( 1 ball ) as my main color and grey ( 2 balls ) as my contrast color. Accessories: Susan Bates 2.75 inch steel yarn needle and scissors. I followed the instructions as they were written and found no mistakes in the pattern. The pattern is easy to follow and I enjoyed working on it. My completed bag measures 13 inches by 13 inches. 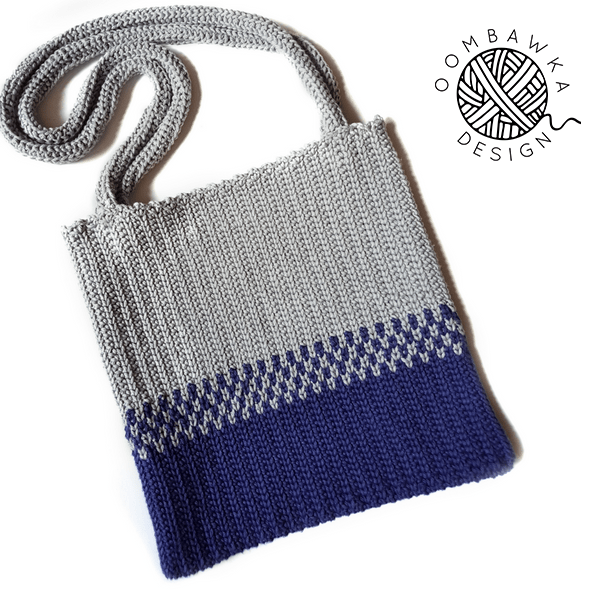 I did not check gauge when I made my tote because I didn’t mind if it was a little bit smaller than the size indicated in the pattern. Apparently I crochet this stitch quite a bit tighter than the Designer! Thank goodness it wasn’t a garment or I would have had a finished project that was much too small! (Note: if you want the bag to be 15 inches by 15 inches check your gauge. I would have needed to use a 6 mm (J) hook to reach the specified gauge). I love the way the strap was crocheted; however, I did find it a bit tricky for my hands to manage (*for those of you visiting for the first time I have some issues with my hands – carpal tunnel and tendinitis in the thumb and arm). The strap is worked in continuous rounds, just like the bag and it is sturdy and strong. It does not stretch when you add weight into the bag so it is an excellent strap design. I muddled through the discomfort and I worked my straps to the suggested length in the pattern. I am very glad I did as I love the finished bag and the straps match the bag perfectly. The way the stitch pattern is crocheted creates a completely straight and invisible seam-line. I was surprised by this as often when I work in continuous rounds my seam line is slightly diagonal. The color changes were surprisingly easy to make and after the first round of alternating colors I was able to work the remaining color-work rounds as quickly as I normally crochet this stitch. I definitely recommend you give this project a go. It is a lovely bag!